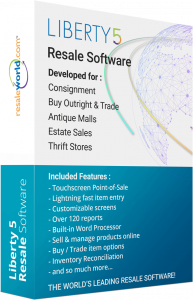 The next generation of resale and consignment software is here. 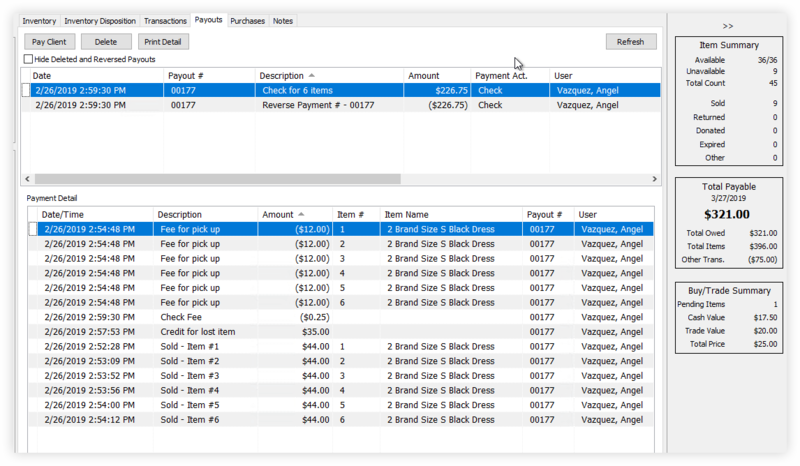 Navigate to the item entry, transaction history, and payout screens by clicking on display tabs positioned across the top of each screen. User customized screens quickly get you the information you need! Customizable ‘User Fields’ help you track unique information about your consignors. You can also label the user fields any way you like! Liberty allows you to store and manage unlimited accounts and make edits to client information quickly and easily. Liberty allows you to create and manage multiple account types – consignors, customers, retails vendors or store accounts. Find accounts by the last name, first name, phone number, city or by their old account number if you previously converted from a manual system or another software program. The inventory display screen shows all consigned items, including their price, price sold, date sold and net amounts owed to the consignor. The bottom of the inventory display shows you what items have sold for and the amount your consignors will receive. Easily transfer items between accounts or update them directly from the inventory display. From the item entry screen, you can print tags (up to 6 different tag styles and over 20 different formats) or item lists, copy items or transfer to another account. 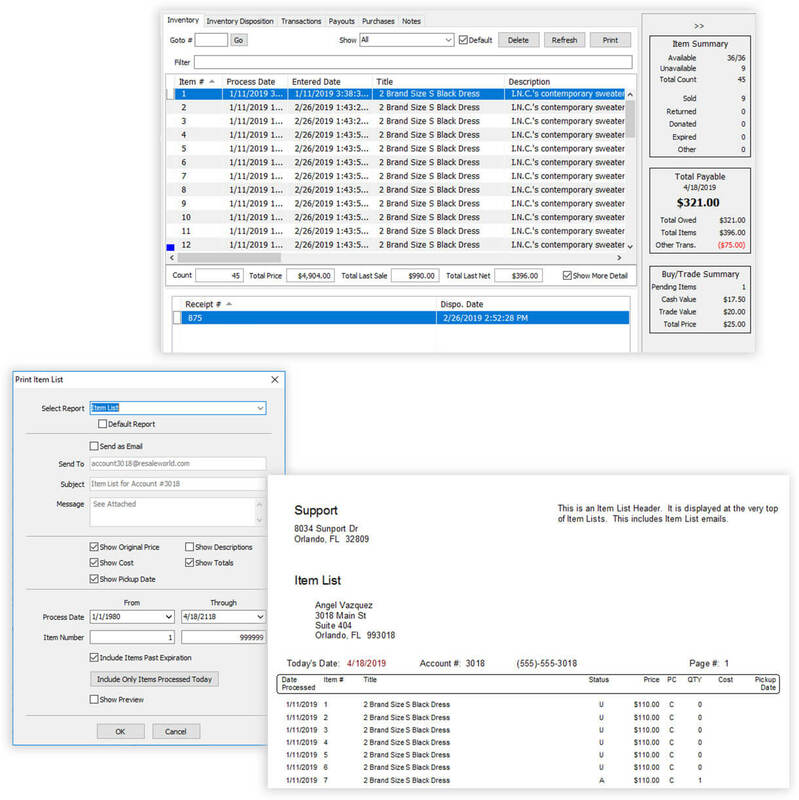 Liberty 5 features the quickest item entry in the industry! Utilizing built-in pop-ups and incremental search you’ll be entering items in no time! When adding inventory, you can record as much or as little information about the item as you wish! 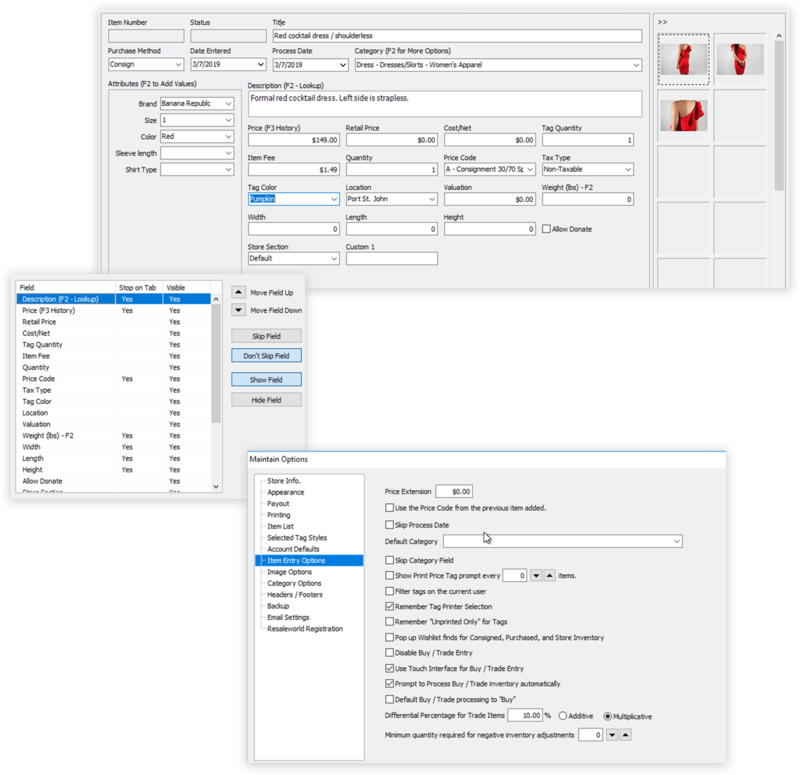 Use the quick copy option to duplicate items in seconds. You can hide fields or choose to skip or jump-to when tabbing between entry fields. 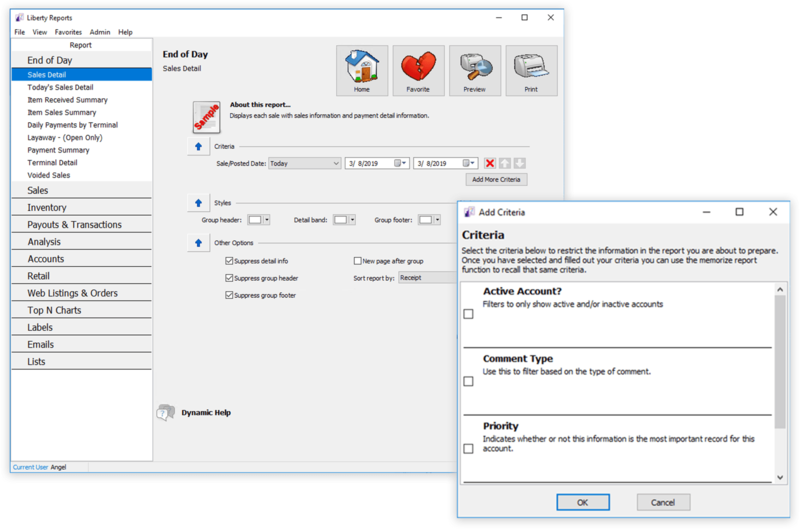 Save additional time by selecting a default category and further customizing the item entry screen from within the ‘Item Entry Options’ screen. You can easily reprint new tags, edit prices or print item lists for consignors from the ‘Item Lookup’ display screen. Liberty even shows you how many items matched your search criteria! You can find an item by brand category, price, date sold, date received, attribute or just about anything else. Liberty is unmatched in flexibility when it comes to price code options! You can have over 500 different price codes set in the system. No other system comes close to providing these types of options. Liberty uses price codes to help set the percentage split between a store and a consignor and also control the markdown schedule of an item. Set your pickup days for a consignor’s items. Liberty will print the calculated pickup date right on the item list. You can also set your reduction period to days, weeks, months or bi-monthly. Liberty offers the ability to create and maintain unlimited markdown schedules. 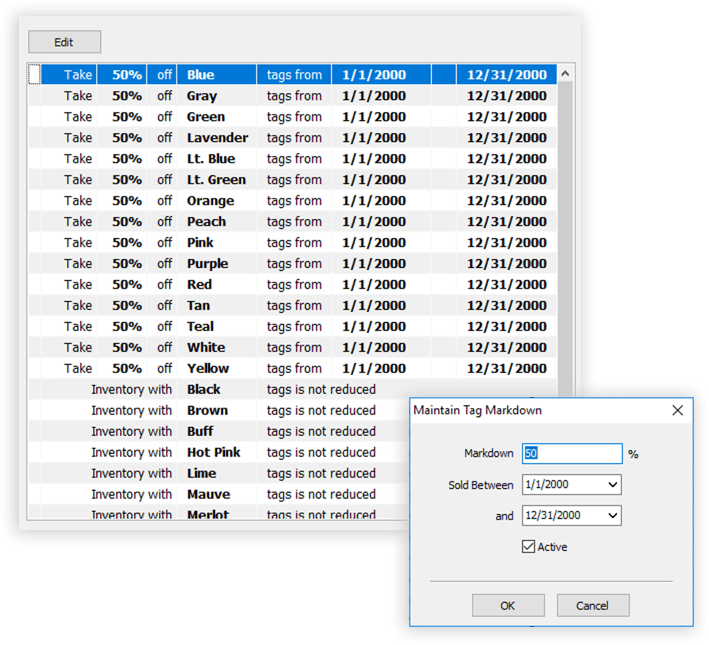 Markdowns can also be set up by tag colors. Assigning a grace period to a markdown schedule allows Liberty to handle ‘Expired’ items that have gone beyond the contract period. Add your item fees to the final selling price of your consigned items to help cover overhead or miscellaneous expenses. 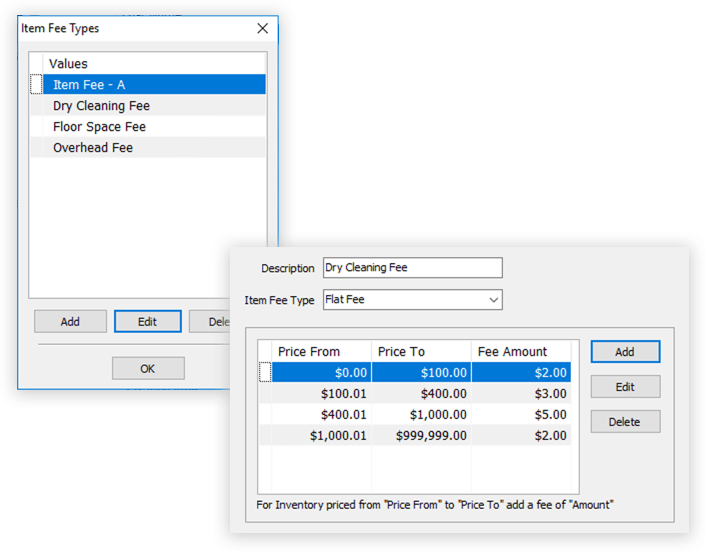 Liberty offers you the ability to decide how item fees should be calculated during sale transactions. Automatically deduct fees from your consignor’s accounts when entering items into Liberty. These small fees can help offset your handling costs. Setting up variable percentage splits based on price is a good option for stores wanting to vary splits based on higher priced items. Liberty even allows you to have variable rates based on time. This is great if your store wants to give higher percentages to consignors if their items have only been in the store for a shorter period of time. Generate more traffic and increase business by negotiating and offering better trade deals. 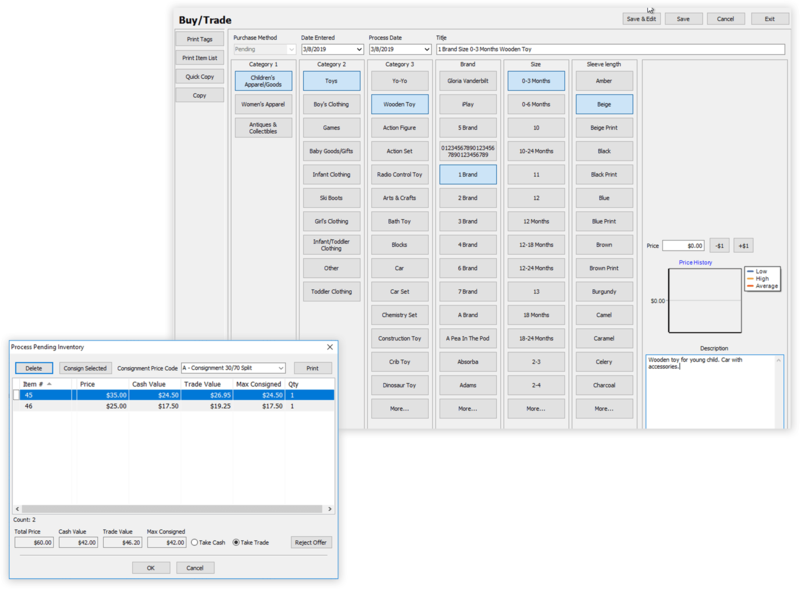 Enter and manage your Buy/Trade items on a new touch screen friendly display. 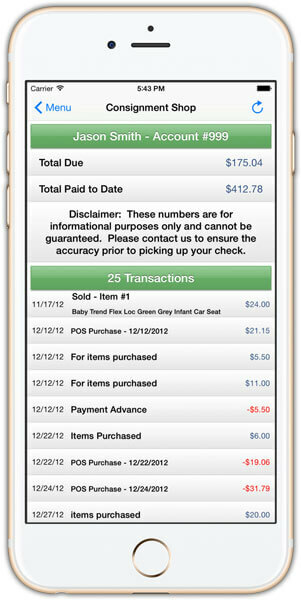 Pull individual items out of a pending Buy/Trade to consign or delete them. 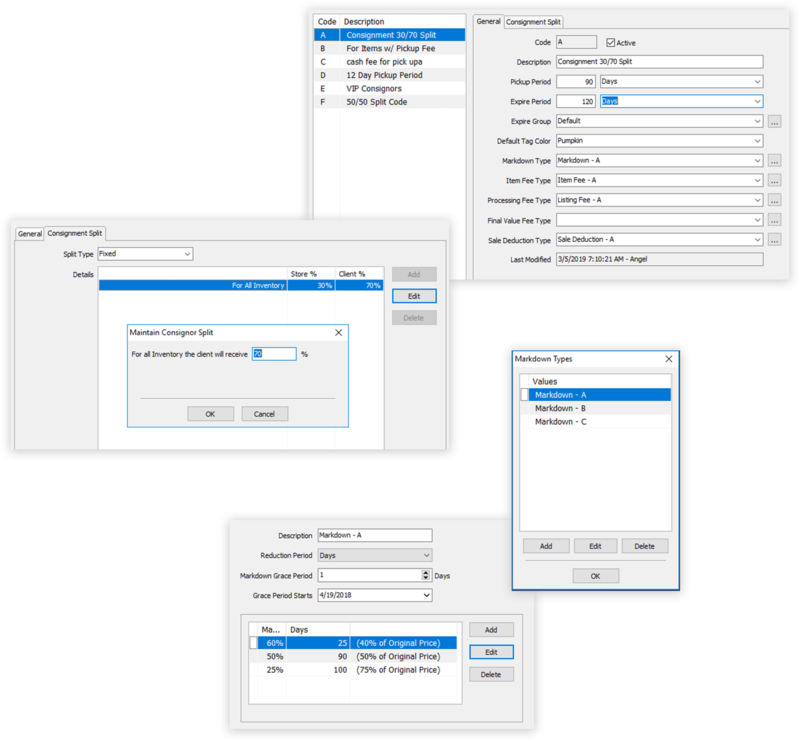 Calculate trade differentials as multiplicative or additive – which accommodates several scenarios that can’t be handled by a strictly additive calculation. This screen is the heart of a consignor’s financial history. Any monetary activity affecting an account will be displayed here. Keep detailed records of all deductions from consignor accounts for things like consignment fees, repairs, cleaning fees, and any “store credit” used by the consignor to make in-store purchases. Always know the total amount owed from items and any deductions that affect their balance by viewing the status bar display. Liberty even handles ‘pay delays’ a feature which allows you to either pay for items sold the previous month or certain period. Choose from various transaction types to subtract or add funds to consignor accounts. Liberty was designed to offer lots of flexibility. Instead of spending hours figuring out how much to pay your consignors, instruct Liberty to do all the work. Pay consignors with Liberty generated checks or by a statement with manually handwritten checks. 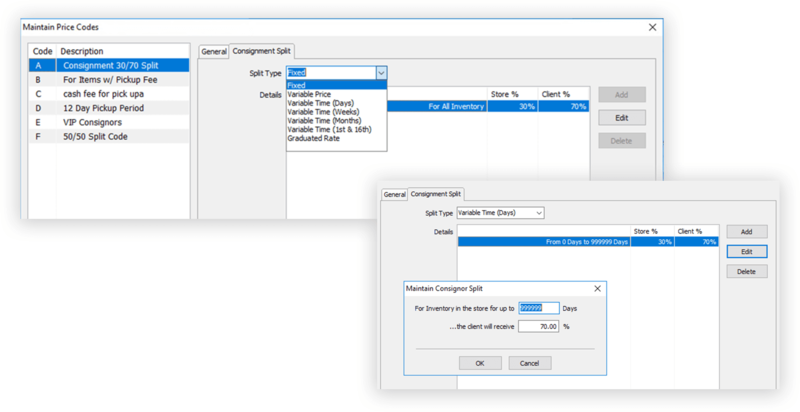 Perform and select which consignors should be included in bulk check-runs each month or payout consignors on-demand as they request them. Set and deduct check fees from consignor payouts to help offset accounting and mailing fees. 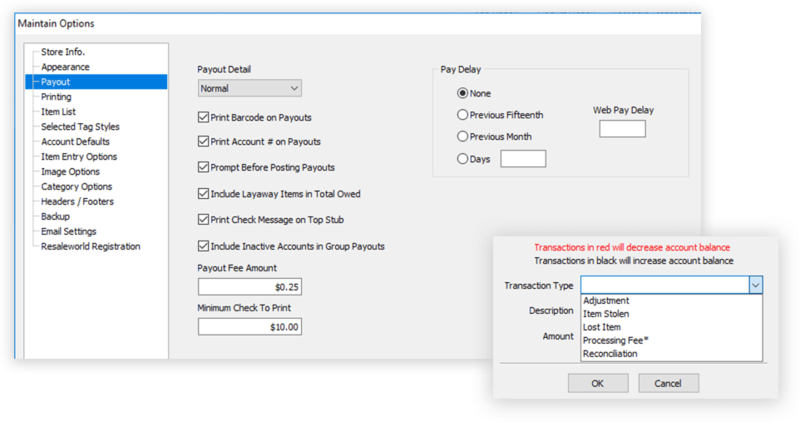 Assign check numbers to payout statements or have Liberty automatically assign them for you. 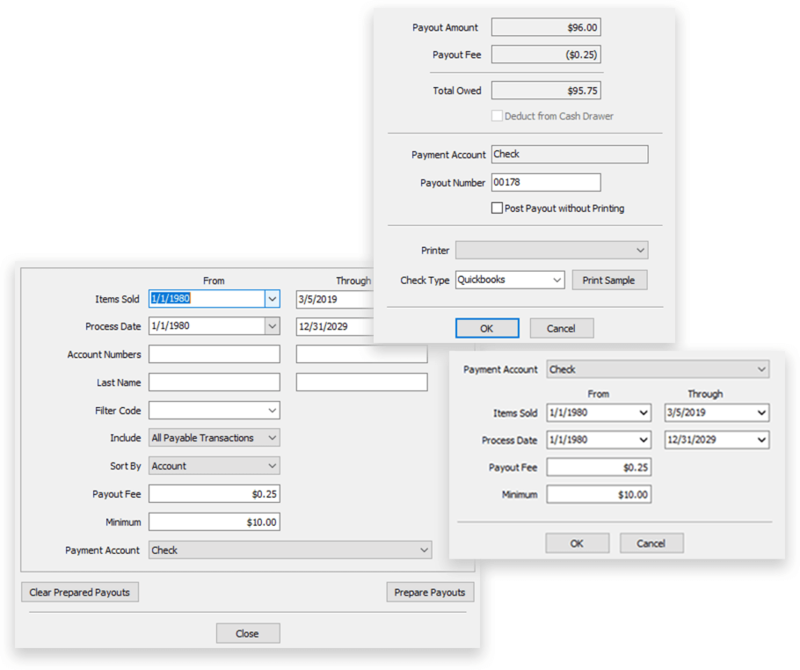 Print Liberty checks in Dot Matrix, Quicken or Laser Style check format and define and select from multiple checking accounts when printing checks. Liberty tracks each payout and displays all financial transactions associated with that payout, including which user voided or reversed a check payout. If a payout is reversed, Liberty displays all entries that make up the reversal. This feature demonstrates Liberty’s tight security controls. 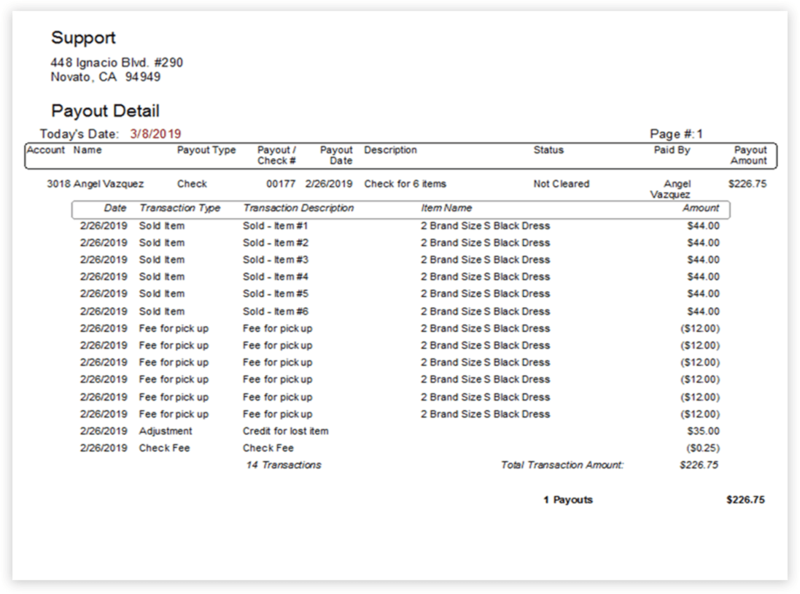 Easily print and preview payout history reports for your consignor’s record keeping. These are the only words needed to describe Liberty’s Point of Sale (POS) program. A single screen controls the posting of items and payments received. Use Liberty’s payment types or even ‘create your own’. Store Credit and Gift Certificates are all handled with ease! You can even use Credit Card Authorization! Need to set up delivery for an item? No problem. Liberty prints this information right on the receipt. This is a great optional feature for large items such as furniture. No other program matches Liberty’s ‘Options’ settings. You can control virtually any prompt or posting option from the Setup Screen. Handling expired items, item fees, and sale post defaults are crucial features needed to help you run your store more efficiently and affectively. Other than when using consignor split coupons, receive a prompt to reprint the original receipt when refunding items. 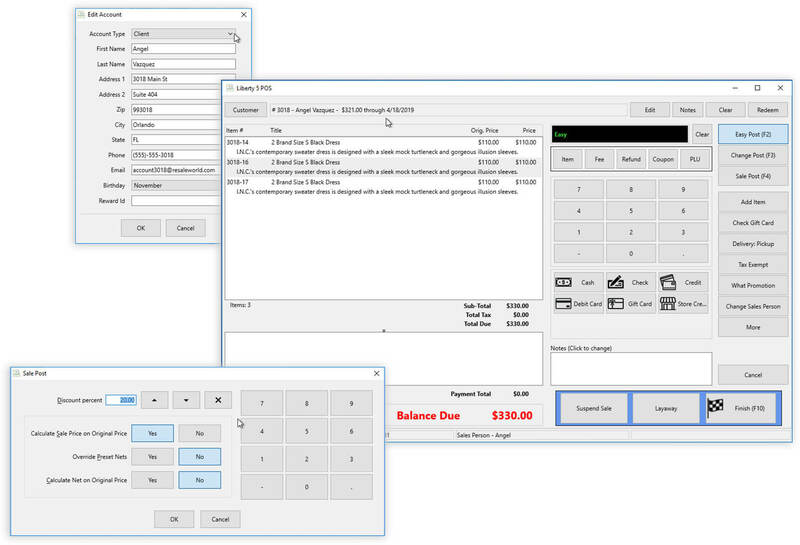 Perform payment advances and access account notes directly from the Point of Sale. 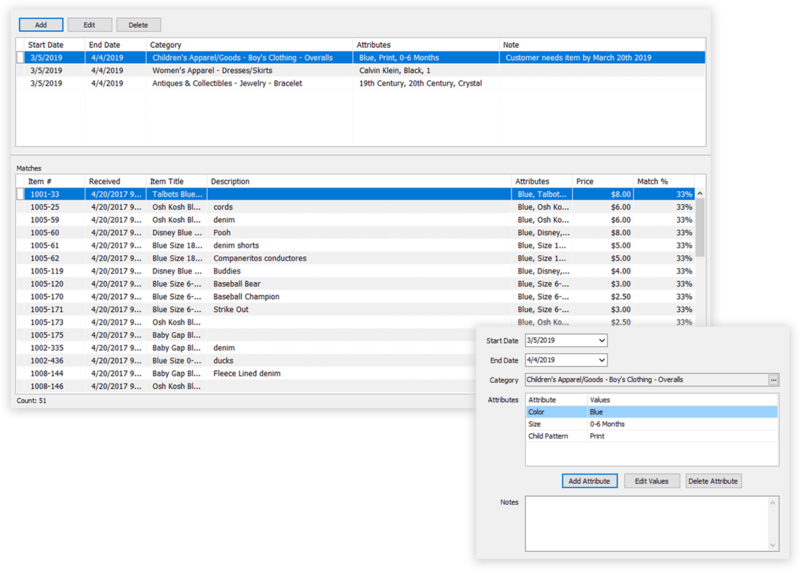 You can now view a preview of selected sales when using lookup screens to reprint receipts, void sales, lookup layaways, or suspend sales. Have you ever needed to discount all items in a sale but preferred having the discounted amount reduced only from the monies going to your consignors? All you need to do is apply the ‘consignor split coupon’. If you need to refund the sale, this coupon will automatically refund the discounted amount. Set up category discounts to automatically discount any items belonging to a specific category when they’re rung up in Point in Sale. 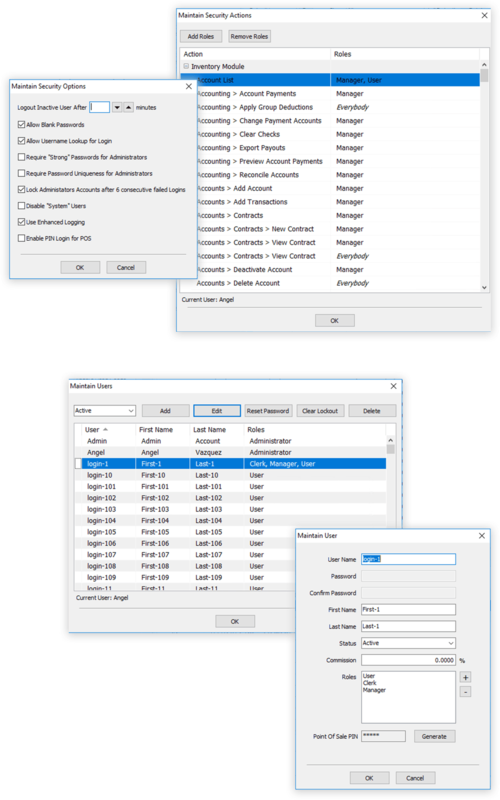 Perform a logged manager-override when employees don’t have access to apply coupons, switch to other sale modes, access the setup options or remove items from layaway. 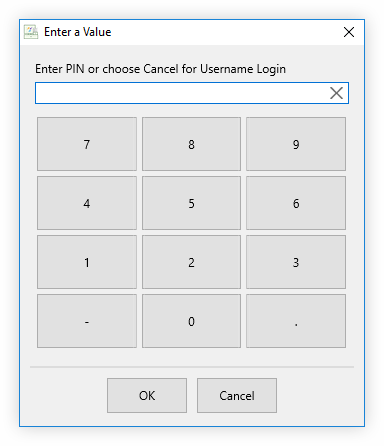 Log into Point of Sale with a PIN code rather than a username and password. An easy way to analyze your data. View performance charts based on categories, brands or periods, or view a summary of recurring fees directly from the Liberty dashboard. The dashboard screen also offers widgets for sharing messages and daily reminders. Several organizational improvements have been made in the Report Module, making it easier to find the report you're looking for. 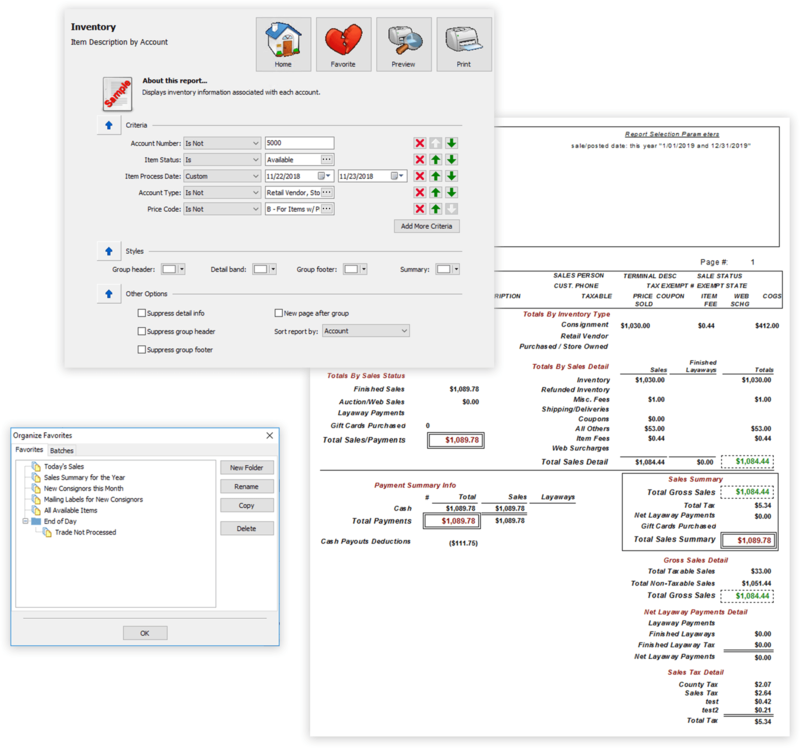 One of Liberty’s best features is its powerful reports. Reports will help you manage your business more efficiently, improve sales, and increase profits. Liberty’s reports are so flexible there is virtually no limit to what you can do. For instance, you can base reports on any: Time Period, Group of Accounts, Category, and/or Status of Inventory Items (sold, not sold, etc.). Once again, our approach is to provide maximum flexibility. By providing nearly one hundred report templates, you can custom create virtually any report you can imagine. 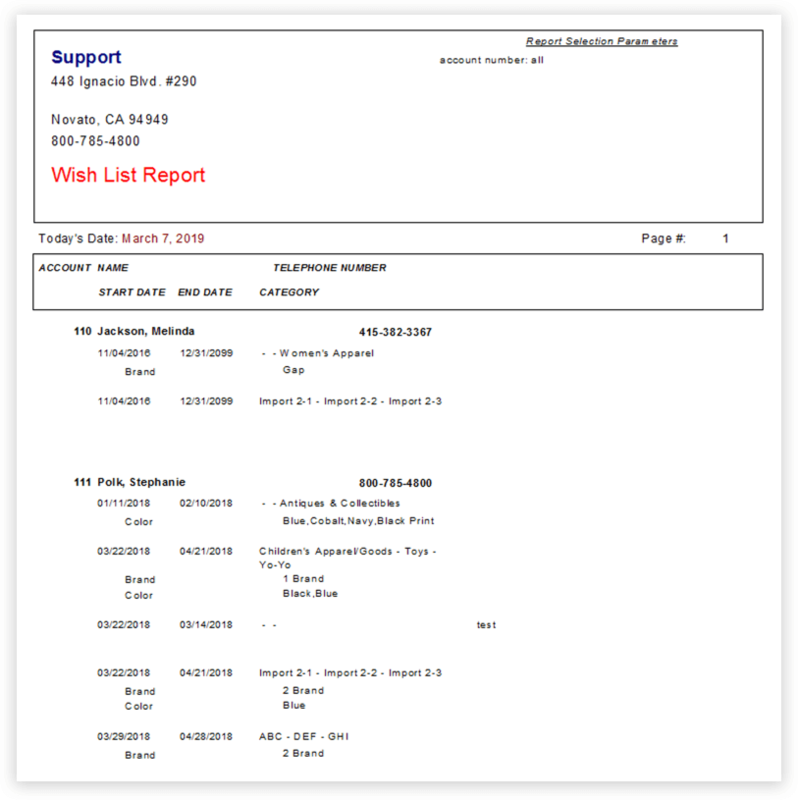 It is also possible to expand more than one report category at a time when searching for the right report to run. Numerous logic improvements have been made to reports – many reports will generate much more quickly now. 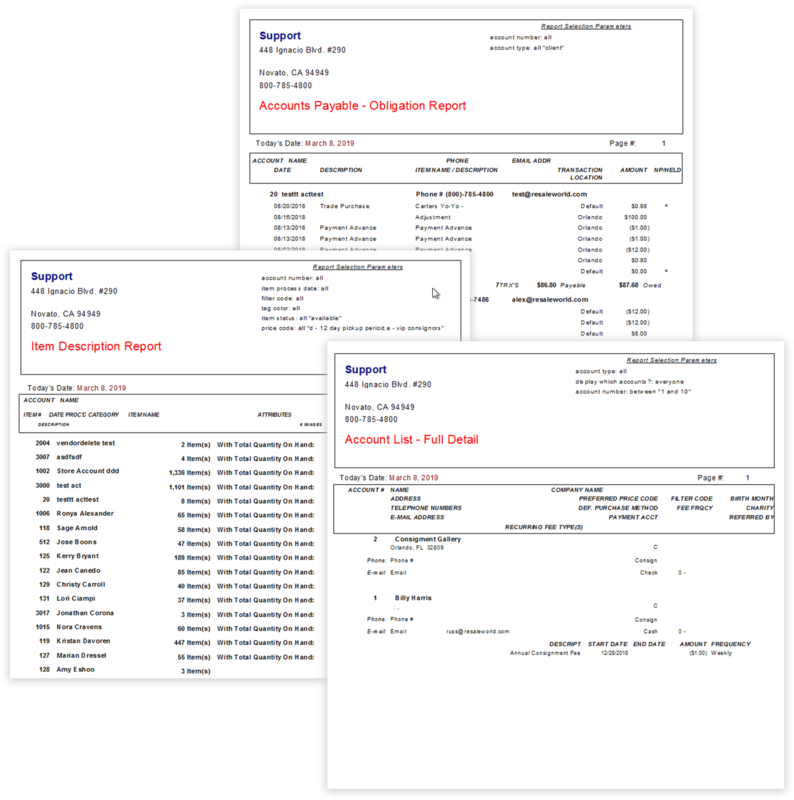 You can even export your report to a word processor, spreadsheet or email. Report parameters are conveniently placed at the top of each report so you can tell exactly what you asked for. Liberty uses the award-winning ‘Crystal Reports’ system to create its many reports. Most reports only take seconds to run even reports that are over 1000 pages long! After previewing, you can easily print the report by just clicking on the print button. It’s fast and easy! Liberty offers a handy wish list feature which allows your customers to log their most desired items. Works hand in hand with Liberty’s unique category and attribute hierarchy allowing consistent matches. The wish list feature has been improved to help you match items more easily. With Liberty 5, you can now set a wish list to find a match with multiple attribute values instead of one. In other words, wishlist entries can be entered to find possible matches of an item in more than one color. You can even add additional details or notes to wishlist entries to help narrow possible matches. You can even print out a report ‘on demand’ which displays all your customers wish list items and any matches that may be in your system. Already have a Shopify website? Already have an existing Shopify website? No problem. Liberty 5 allows can integrate with any Shopify website. List products directly to your Shopify website from within your Liberty program. Sell more and accomplish more in less steps with less hassle. All aspects of the management of web listings have been moved into a new Listing Manager module. Essentially, this combines Liberty 4’s previous Order Manager, Event Manager, and Inventory Module’s Storefront & Auction items areas. Web Listings are a completely new concept in Liberty 5. Rather than an item having several web properties and web statuses, a Web Listing associates a Liberty Item with a single marketplace that the item is/will be listed to, and contains properties specific for the online item. From both a workflow and security standpoint, separating the management of web listings from Inventory Module offers several advantages – an employee specifically responsible for setting up web listings doesn’t even need to have access to the Inventory Module. By managing lists of the same item to different online marketplaces separately, it’s now possible to have the same item listed in different places for different prices and with different titles & descriptions. Liberty treats each instance where the same item is listed to eBay as a different Web Listing. This makes it significantly easier to look back at listing history of a single item that’s not been selling. 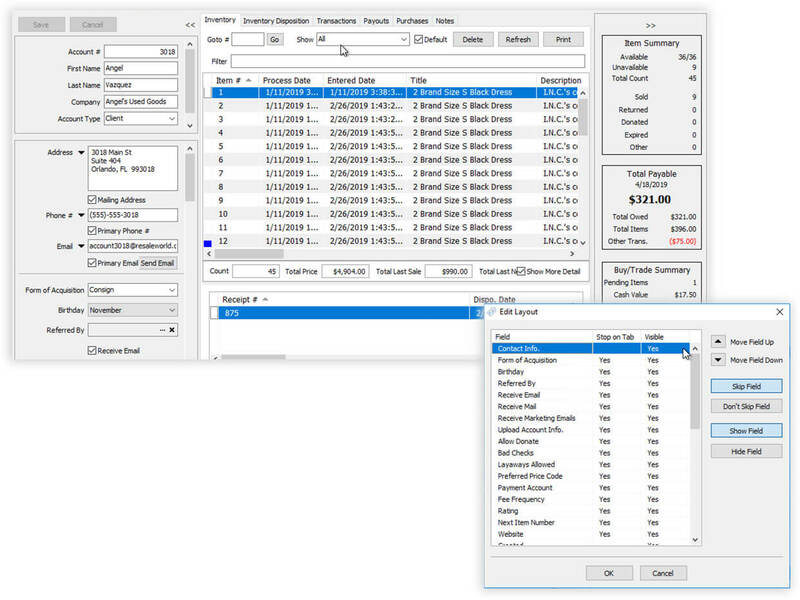 This model also allows for several simultaneous auction listings for multiple quantity items. 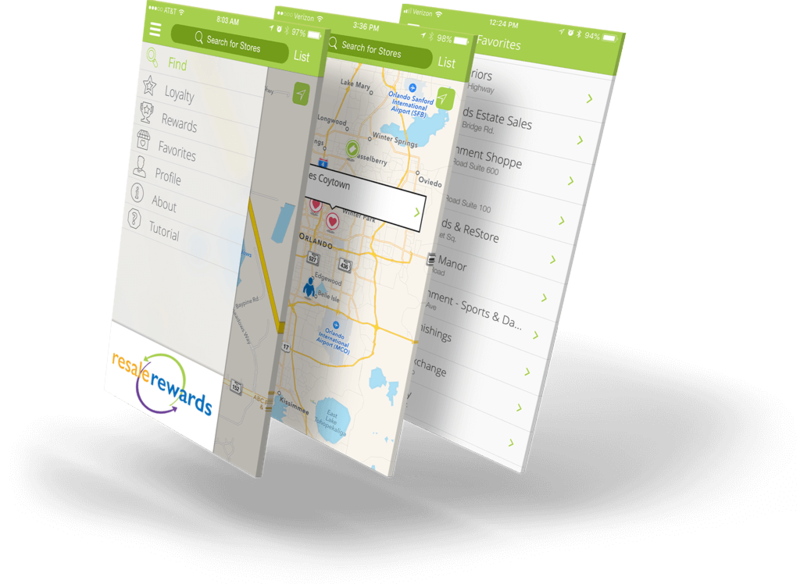 Resale Rewards, is a customer rewards mobile app exclusive to Liberty merchants. Reward customers that shop often and build lasting relationships that will help your business grow. Reward loyal customers and keep them updated on upcoming sales and promotions. Just mention the mobile app at the checkout counter, enter their phone number on the POS screen and shoppers become eligible to receive a $10 coupon when purchasing $200 worth of items. What? You haven’t integrated your payment processing yet? For practically every business, it’s not a question of ‘if’…it’s a matter of ‘when’. Having an integrated payment processing solution that provides reliable data on exactly how much money a business has available at the end of each business day helps it better manage payroll and inventory, pay vendors, and make better, more informed operating decisions. 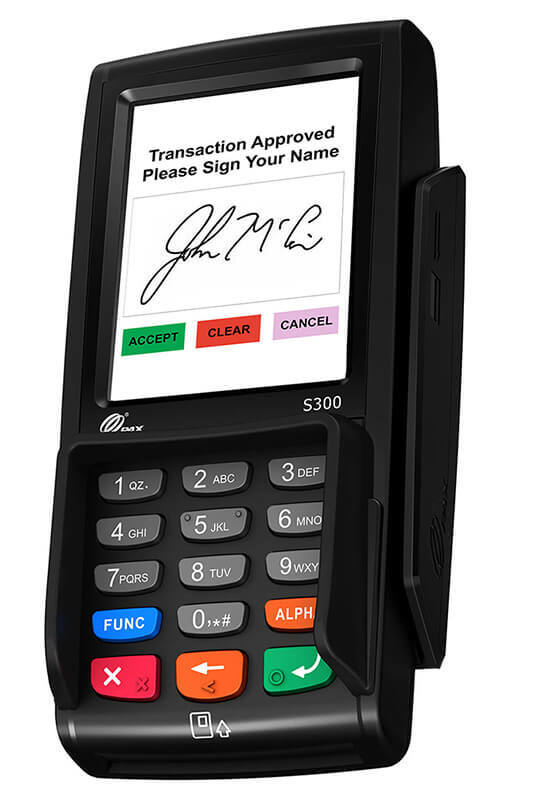 Payment processing integration easily and automatically allows for payment transaction data from credit/debit cards to directly flow into your business account. In addition, eliminating the ‘human element’ decreases the opportunity for errors to be made, either in the form of duplicate entries or sale amounts entered incorrectly. Your time is valuable and the reliance on manual data entry can be very frustrating and mistakes can be costly. We've touched up some of our more commonly used integrations to help you accomplish more in fewer steps. Several new features have been added, which give you more control over how information is sent to Constant Contact. The Constant Contact export module can now pull in existing lists from your Constant Contact account and allows for one of these to be selected. Manage lists directly from the module. Manage Constant Contact lists directly from this module. You can now perform actions such as add or delete lists or remove a single contact from a list. Update lists with missing contacts. Sending contacts from Liberty to an existing list now adds any not-present accounts to the list, rather than clearing what’s in the list first. The Liberty 5 Quickbooks Link is now capable of exporting to Quickbooks Online in addition to Quickbooks Desktop installations. A new Export History feature allows for an easy-to-read view of what happened in previous exports. 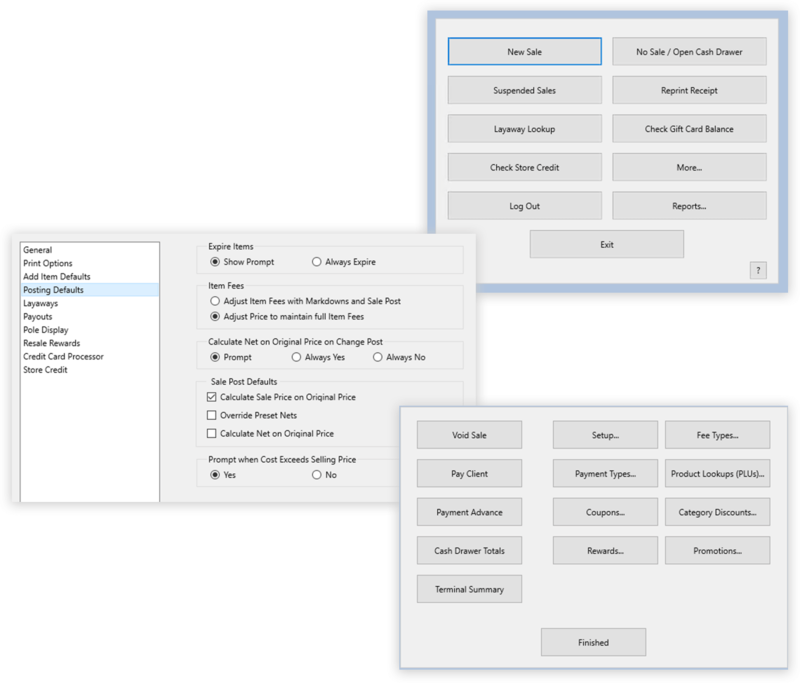 This feature also includes an export reset function, which allows you to set Liberty transactions included in a previous export to be exported again – vital in cases where a Quickbooks backup had to be restored to a point before a Liberty export occurred. Different coupon types can be mapped to various QuickBooks accounts. Multi-location stores can now set up location-specific classes to separate out transactions by location. The Word Processor module has been completely redesigned and the new workflow makes it much easier to use. Word processing is very easy and most of the controls are just a mouse-click away! 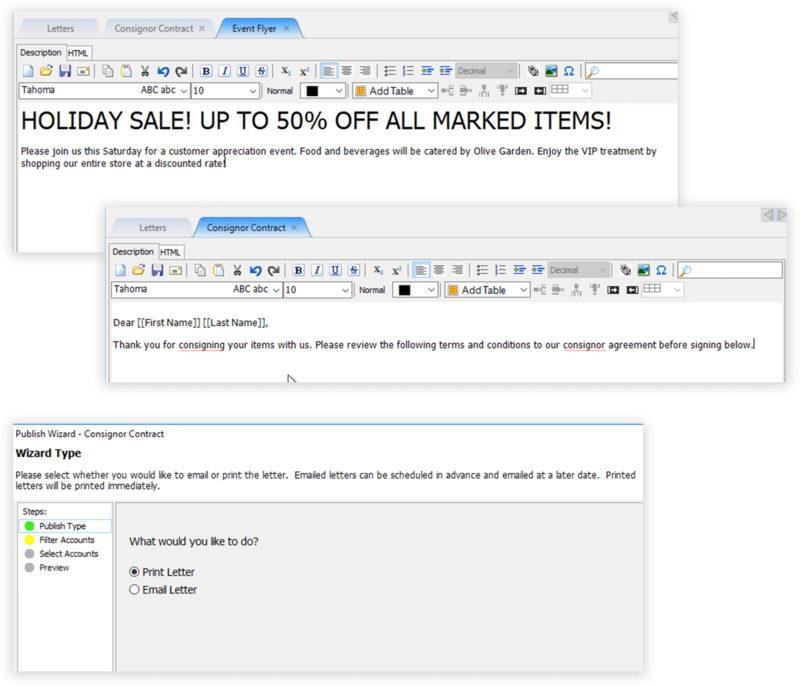 Create letters and emails easily for print or email to your consignors and customers from the integrated word processor. All these utilities include a new filtering system that helps to select the correct accounts. You have the ability to save a set of filters so that you can easily use it again later. These filter sets are all shared between various modules. Liberty 5’s handling of emails has been completely redesigned. All Liberty components now send emails through a single email processor, which has been updated to use current security standards. It is possible to view a history of recent and pending emails from a new email management module. The Account Export utility allows for Liberty Accounts to be exported to a Comma Separated value (CSV) file, which can then be imported into other services (such as MailChimp). 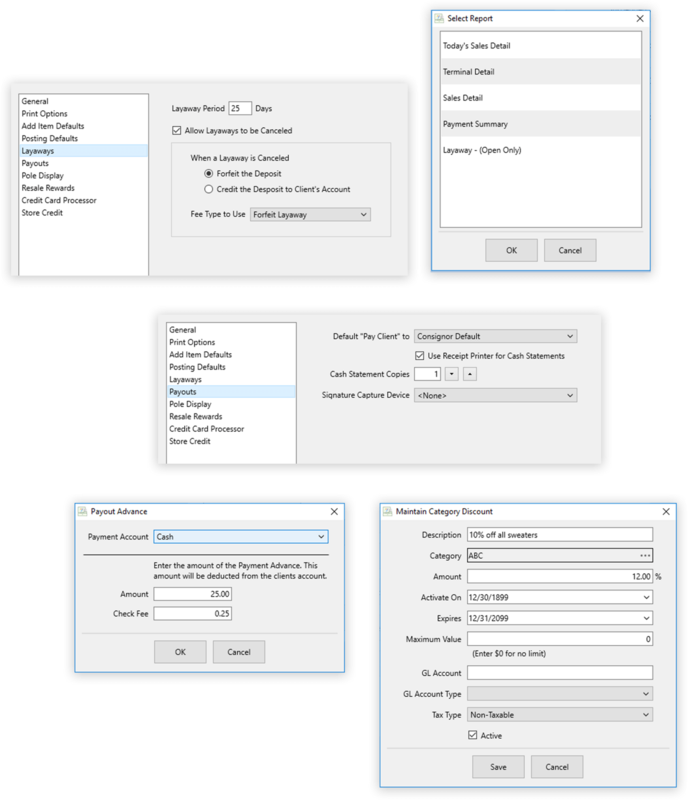 This powerful utility allows you to select which account fields to include in the export. You can now define administrative roles within your organization (cashiers, intake, and managers). Grant access to various features to a role before assigning them to user accounts. Additionally, the list of Application Security Actions is organized by area of the software, making it easier to find specific settings. These changes make Liberty’s security easier to understand and manage than ever before. 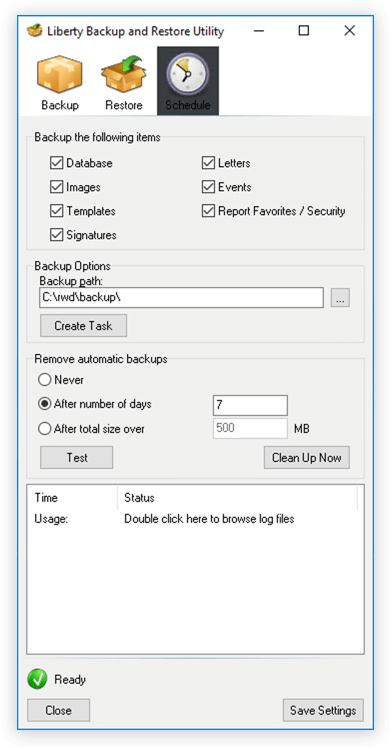 Create and manage automated backups quickly and easily. Choose which days and type of data you would like have backed up automatically. The backup utility also allows you to select a location on where to store your automated backups.